As the Confederacy felt itself slipping beneath the Union juggernaut in late 1864, the South launched a desperate counteroffensive to shatter the U.S. economy and force a standoff. Its secret weapon? A state-of-the-art raiding ship whose mission was to prowl the world's oceans and sink the U.S. merchant fleet. The raider's name was Shenandoah, and her executive officer was Conway Whittle, a twenty-four-year-old warrior who might have stepped from the pages of Arthurian legend. Whittle would share command with a dark and brooding veteran of the seas, Capt. James Waddell, and together with a crew of strays, misfits, and strangers, they would spend nearly a year sailing two-thirds of the way around the globe, destroying dozens of Union ships and taking more than a thousand prisoners, all while continually dodging the enemy. 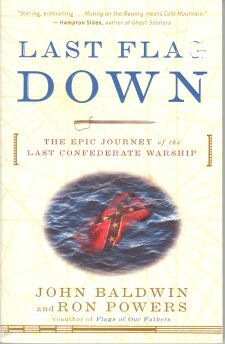 Then, in August of 1865, a British ship revealed the shocking truth to the men of Shenandoah: The war had been over for months, and they were now being hunted as pirates. What ensued was an incredible 15,000-mile journey to the one place the crew hoped to find sanctuary, only to discover that their fate would depend on how they answered a single question. Wondrously evocative and filled with drama and poignancy, Last Flag Down is a riveting story of courage, nobility, and rare comradeship forged in the quest to achieve the impossible.